The trillium, which is part of the lily family, is a flower that has three symmetrical petals that sit atop three symmetrical leaves. Because of this characteristic, it is commonly referred to as the “trinity flower” because by some it is viewed as a reminder of the Holy Trinity: God the Father, Son and Holy Spirit. Some also view it as nature’s representation of the Triple Goddess, who encompasses the three stages of every woman’s life, the Maiden, Mother, and Crone. 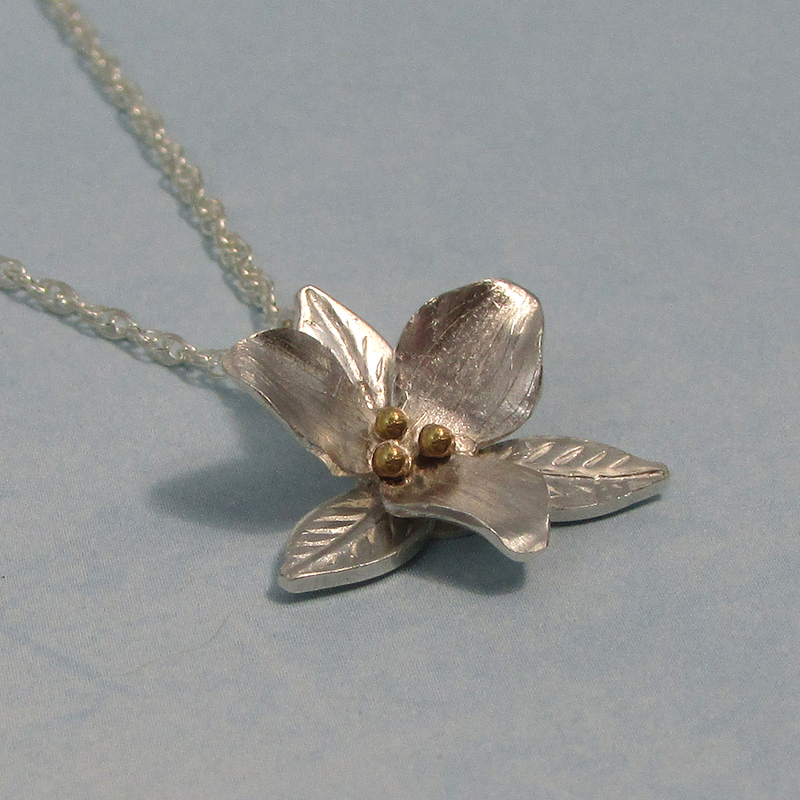 When designing my trillium necklace, I really wanted the symmetry to take center stage, so instead of setting the flower with a colorful gemstone, I wanted it to be a little more understated, with only three small 14kt gold granulation balls forming the stamen in the center. This flower is also known by a few other interesting names. Sometimes it is called a toadshade, because to some it resembles a toad-sized umbrella. And because it is one of the first spring flowers of the season, the red trillium is sometimes known as the Wakerobin because it blooms when the first robins make their appearance. Lastly, it is sometimes called a Birthroot because of it’s medicinal uses during childbirth. The trillium flower symbolizes recovery, beauty and purity. It is the a perfect flower for someone who overcomes life's challenges with grace, strength and dignity. She is quiet. She is strong. She is steadfast. She is beautiful. And you can claim yours here. Another flower will be added next week to the Blossoms Collection, so be sure to check back here. And if you want to be one of the first to find out what it is, join my Insider’s Club! Now go breathe in that beautiful spring air!